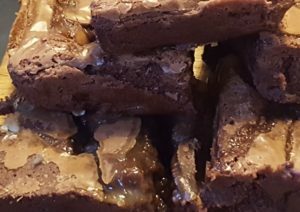 Blog Emma's Cakes "take the biscuit"
The School House Café has been open for about 4 months now and we are seeing a growing community of customers. If you haven’t been there please pop in to see it and do try one of Emma’s cakes. 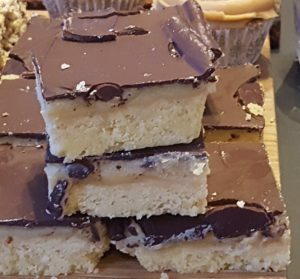 Today you could try one of our best sellers, Millionaire Shortbread or a gluten free, Salted Caramel Brownie. Alternatively you could try a slice of our newly introduced “cakes of the week”. We recently provided cakes for the Diocese of Gloucester’s “Life Party” and for the February’s Cheltenham Deanery Synod. They all went down very well and I am told even the Bishop liked them. So now you can buy a box of 6 for your friends and family for just a fiver, allowing those who cannot get down to the Café to sample Emma’s cakes. Then let us know via social media, whether you agree with me that Emma’s cakes “take the biscuit”. 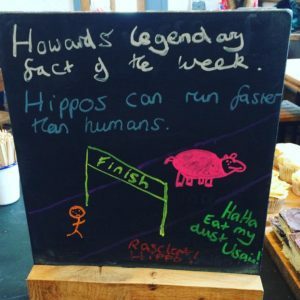 You will also be able to catch Howard’s latest fact of the week, which is becoming something of a Social Media hot topic. For those of you who have been following us, or have read my other blogs, you will know that the School House Café is Fresh Hope’s first project and has been created to be a Community Café. the community of individuals who are finding it hard to get into work and need a stepping stone. I will expand on each of these but before I do I want to just touch on a point I made in my last blog. If this was just a business and I was the owner, I would be taking a very different approach. I would be seeking to keep costs down by trying to do as many jobs as possible myself. I would spend all my evenings marketing the Café and thinking of new ideas to generate income. You would find me working in the Café virtually everyday, although my coffee making abilities may make this approach counter productive! It would be known as David’s Café and it would succeed or otherwise based upon my skills and efforts. But it isn’t my Café and that is not what we want. So me just working hard to ensure the Café is a success, would in fact be a failure. The Café can only succeed if it is “owned” by all of us, the communities that use and support it. Which means that the hard work undoubtedly needed to make the Café successful must come from us all. For those interested, Exodus 18 illustrates this principal. So what does it mean to bless the community that we are located in? Firstly we need to recognise that we are probably talking about two separate communities, the long term residents of St Paul’s and students attending the university. These groups do have some similarities but also some significant differences. In thinking about the residents of St Paul’s, the first thing we want to achieve is to have a Café that is accessible. That means that our pricing needs to be somewhat lower than our high street rivals while at the same time trying to offer an equal or better quality. This must apply both to our offerings for adults and children. We will further be able to do this, once we are able to make more of what we sell ourselves, but we need to get the kitchen up to scratch first, which we hope to see in operation from early March. Secondly we wanted to offer an attractive space where groups from the community could meet together. The Café is quite small, so we are looking at how we can best accommodate such groups. The overflow area in the hall is only a temporary first step in achieving this. Thirdly we want to offer activities for people in the community, for example a craft event or a bouncy castle in the hall. This might be done directly through the Café, or via other Fresh Hope projects in the pipeline. The requirements of students are different but we need to start in the same place, that is our offerings need to be accessible and of the right quality. We have provided free Wi-Fi from the start to allow students to sit in the Café and work. Beyond that, we still need to do more to understand the needs of students. We would like to get a takeaway offering for breakfast that students would find very attractive. We would also like to provide a lunch offering that attracts more students. Any and all ideas to david.lynch@freshhope.co. 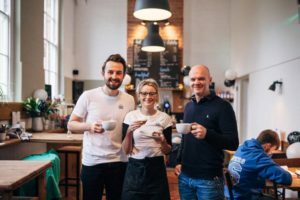 Creating a community of people who use the Café regularly is superficially very simple, we need to create a place that people want to go to, combined with an atmosphere that is friendly and attractive and an offering which is good quality and value. Challenges include the lack of space which I have mentioned before. But also we are looking to create a resource that is more than just a Café. 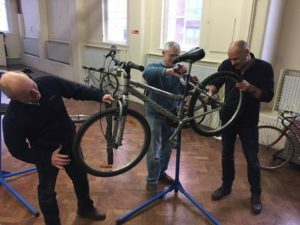 As I have mentioned elsewhere, we plan to offer cycle maintenance, repair and refurbished cycles for sale. This work has now started. We believe that people will choose to come to us rather than other very nice places, because of the good work that we are using the Café to fund and enable. While I believe that it is right to get the Café on a stable footing before we attempt to do too much more, these other components are a key part of the vision and are in my view integral to our success. want to get involved in any way, please email me at the above address. Also please watch out for the Café on social media and spread the word. But also please do not be afraid to send me comments and criticisms. We genuinely want to improve! Which in turn leads me to the last community I listed, those in need of a stepping stone into employment. I have already said that we need to create a stable platform first, and to get a team of volunteers who will sit alongside these individuals to help them build the confidence and skills to get back into employment. We see this community operating in the Café and perhaps separately on the cycle team. At first we just want them to get used to working, but in the fullness of time we could imagine them picking up skills and qualifications such as NVQs. We have already started a dialogue with the King’s Table ministry at Trinity Cheltenham with a view to identifying suitable candidates. Also one or two potential candidates have approached us. But we are open to other ideas, and if you know of people or groups that we should be talking to please let us know. For those of us in Fresh Hope, and those working in the School House Café, community in all its forms is key to our success. It is all about relationships and all about sharing the vision and the responsibilities. I would like to thank each and every one of you for being part of the community that cares about Fresh Hope and the School House Café. If you are interested in doing more, or if you know someone who might be interested, please get in touch with me.